A classic Michigan shipwreck story filled with treasure, whiskey and some of the best underwater shipwreck footage ever shown publicly. 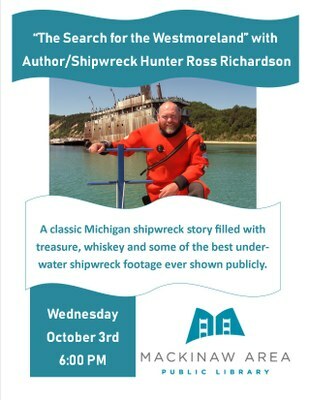 The Mackinaw Area Public Library is pleased to announce an appearance by local author and shipwreck hunter Ross Richardson on Wednesday, October 3rd at 6 PM. He will be giving a presentation based on his book The Search for the Westmoreland. On December 7, 1854, the Westmoreland foundered in deep water near Sleeping Bear Dune, killing seventeen of her crew and passengers. Seventeen crew and passengers lived, however, and landed in lifeboats on the shore of Platte Bay. Soon after the passenger steamer's sinking, rumors began circulating of $10,000 in gold coins in her safe and 280 barrels of whiskey in her hold. For the next 150 years the Westmoreland was one of the most sought after shipwrecks in all the Great Lakes, eluding salvagers, shipwreck hunters, and divers alike.